Although most lung cancer is caused by prolonged use of tobacco, there are other factors that may be a cause. These include genetics and exposure certain environmental elements like radon, asbestos or air pollution. More lung cancer clinical research is needed to completely understand this disease. If you are a lung cancer survivor or are currently dealing with lung cancer please contact us about participating in a lung cancer clinical trial. These trials are always at no cost to you. You may be able to help us further our knowledge about causes and cures for lung cancer. Lung cancer occurs when there is uncontrolled cancer cell growth in the lungs. Metastasis is when these cells then grow beyond the lungs. Common lung cancer symptoms include shortness of breath, coughing (often with blood) and weight loss. There are two main types of lung cancer – small cell lung carcinoma and non-small cell lung carcinoma. The distinction is important because the type of lung cancer dictates the best treatment. The course of action for lung cancer treatments depends on the type and severity of the cancer. Small cell lung carcinoma has usually progressed to the point where surgery is not an option, so it is treated using chemotherapy and radiation. In many non-small cell lung carcinomas surgery is possible to remove the cancerous cells. This is usually combined with radiation. 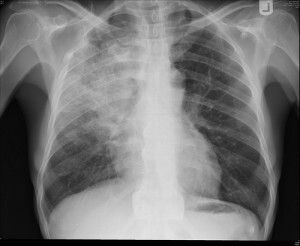 Chest x-rays and then biopsies are used to determine the prognosis and implement a plan of action for the lung cancer treatment.